Our $200 gaming PC performs admirably in modern titles and looks great too. PC gaming is a lot cheaper than it used to be. Today, you can build a PC to play modern titles for a fraction of the price that you used to pay. Considering how many games are now free online and the fact that when you buy a PC game you keep it, there’s a strong argument to be made that it’s actually cheaper for you in the long-run to be a PC gamer than console gamer. For this reason, and because I’m an avid PC gamer, I set out to make a super cheap gaming rig that just about anyone can afford. Hopefully, this also includes my friend in Brazil who pays nearly double the price we pay here in the US in a currency that’s that trades 3:1 vs. the dollar. Despite AMD struggles with spending too much in order to create and sell too few of their APUs, these budget processors offer solid graphical and processing performance at this price level. Since we can’t afford a dedicated graphics card, this is the next-to-best thing. Considering that we’re getting this type of performance on medium settings, you should be able to lower the settings and get high FPS in 1080p or go with higher settings and play in 720p without a problem. I know from experience that going with low settings in 1080p for a game like Battlefield 4 is also more than possible. 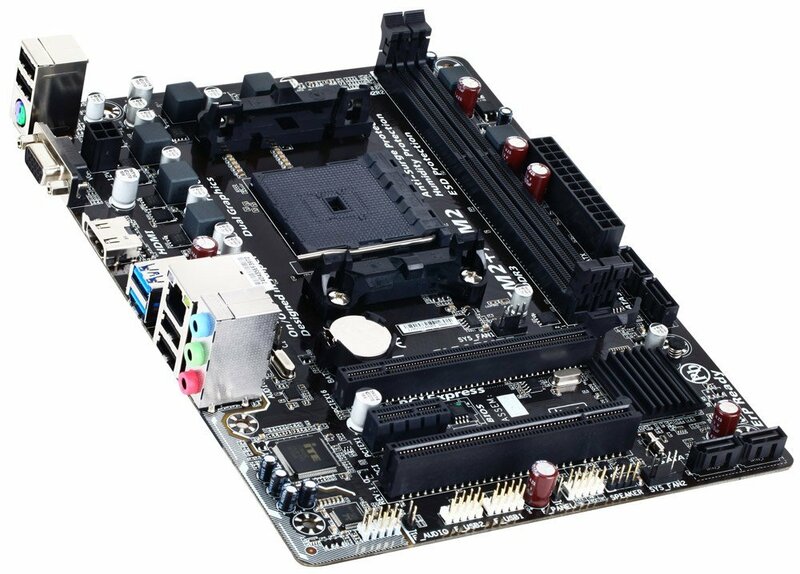 It may be cheap, but this Gigabyte FM2+ Motherboard has enough features for what we’re trying to do. We’re going for whatever we can get for as cheap as possible. During the last couple of months, I’ve been able to find various Gigabyte FM2+ motherboards for around $33 after rebate. If you’re trying to stick within the $200 budget, you’ll need to find a similar deal. Keep in mind that most of these motherboards don’t have USB 3.0 headers for the front I/O of your case. You’ll need a cable to convert them if you want to use them as USB 2.0 or need to spend a little more in order to get a board with USB 3.0 headers. A third option would be to ignore the headers and the front of your case as USB 3.0 is still available in the back of the case. For me, the price had to be the most important thing. Luckily, with Gigabyte you should get solid reliability as well. For APUs, you need to use dual channel memory. The performance vs. using a single stick is much improved. For that reason, you’ll want to go with either 2×2 or 2×4 here. Considering anything reliable in a 2×2 configuration costs around $30 and a 2×4 costs as little as $40 you’d be crazy to go with anything but 2×4. At the time of writing this I was able to find 8GB of Corsair Vengeance memory for 39.99. These sales come up randomly during the year or often during the holidays. The case I used for my build turned out to be a lot better than I thought. It’s sturdy and was $19.99 after rebate when I bought it. Today the sale price on it is $23. Overall, it’s a good buy for a case with USB 3.0 headers and a blue front LED fan but mostly I chose it because it was cheap. Unfortunately, we don’t have a lot to spend on our hard drive here. That’s a shame as storage tends to get cheaper per gigabyte when you choose higher capacity drives. Still, for $27 we get a drive with a 320GB capacity. You might eventually have to move around or delete a few of your games. Luckily, apps like Steam and Origin make it easy to reinstall games later on if you want to play them again. We didn’t have a whole lot of money for the power supply, but I wanted something reasonably reliable and 80 Plus certified. For this, I chose EVGA’s 430W to 500W power supplies which regularly run $25 after rebate. While the capacitors in these PSUs aren’t as high quality as something you’ll find in a $100 plus CPU, they are good enough for this build and should last you a long time. I’d have no problem recommending them at this level. Overall, this rig is pretty killer for just $200. You’ll be able to play games like WoW, Minecraft, Hearthstone, League of Legends, CSGO, and countless others without a problem. That’s the goal here. Not to smash ultra high-resolution graphics in 4k but rather to be able to play. Isn’t that what everyone wants anyway? Want to go even cheaper? 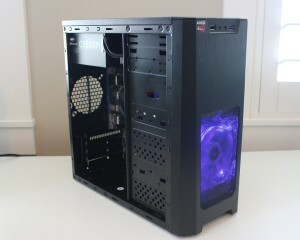 Take a look at the $150 version of this PC here.